JK Rowling’s reps have claimed she had a “clumsy and middle-aged moment” – after she liked a tweet that referred to trans women as ‘men in dresses’. The beloved Harry Potter author shocked fans yesterday when she liked a controversial tweet amid a row about the status of transgender women in the left-wing Labour Party. After a surge in anti-trans rhetoric, a fringe group of campaigners have led calls for transgender women to be banned from standing on Labour’s women-only shortlists for Parliament, and have threatened to resign from the party if it does not agree to their demands. Rowling, a prominent Labour supporter who frequently engages in issues around the party, ‘liked’ a message about the campaign from a prominent anti-transgender campaigner. 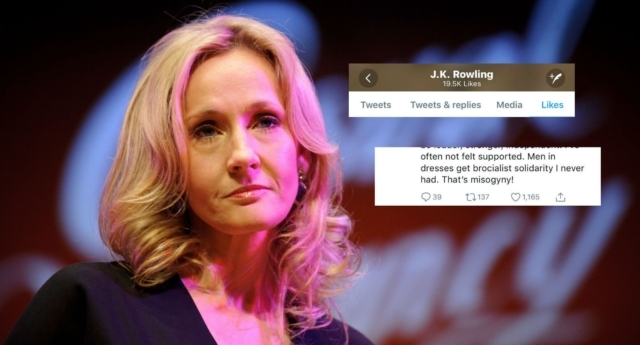 As Twitter frequently shows people’s liked tweets in users’ feeds, a number of fans were shocked to see the message pop up on their timeline as being ‘liked’ by Rowling. Approached for comment, a spokesperson for the author told PinkNews that she had not intentionally liked the message. A string of messages criticising Rowling had gone viral. Trans journalist Shon Faye led the criticism, pointing out that the Twitter user who penned the message, who has since made their account private, has previously sent messages referring to transgender women as ‘men’. The author previously included a transgender character in detective novel The Silkworm, which she wrote under the pen name Robert Galbraith. But anti-transgender activists on internet forum Mumsnet seemed thrilled with the author after the Twitter row. The message disappeared from Rowling’s feed after the criticism. Reps for Rowling did not respond to a request for comment from PinkNews. The author also recently came under fire from LGBT fans when it was confirmed that her upcoming film Fantastic Beasts 2 will feature an area of Harry Potter history long believed to have included a gay romance – but will not address it. The film will feature Jude Law as a younger version of Hogwarts headmaster Albus Dumbledore, finally addressing his relationship with dark wizard Gellert Grindelwald – with whom the Harry Potter books suggested he was in love. But the film’s director said in an interview that Dumbledore would not be “explicitly gay” in the film despite the focus on him and Grindelwald – leading fans to accuse Rowling of ‘queerbaiting’ by failing to commit Dumbledore’s sexuality to screen. Others accused the author of selling out by allowing the plot to be ‘straightwashed’ for a global blockbuster audience. Major films that feature LGBT content frequently struggle to get a global cinema release and often take a hit at the global box office due to anti-LGBT regulations in some markets.